​Want to learn about the Vitamix 5300 vs the 7500? You're in the right place! A helpful comparison chart which breaks down the important features of the 5300 and 7500. Our pick based on over seven years of working with Vitamix blenders. The 5300 and the 7500 have the exact same horsepower - 2.2-peak. This is the top range for the Vitamix and it beats most of their older gen models which were 2-peak. It's more than enough power to make anything you could ever want in a blender: soups, smoothies, nut butters, dips, salsas, etc. The 2-peak had enough power to do all that and having a 2.2 upgraded motor makes it even easier. With the pulse function and variable speed knob, the 5300 and 7500 have pretty much identical interfaces. Neither have any of the pre-programmed functions that come with some of the newer-gen Vitamix units. However, I've always been of the opinion that the variable speed knob and tamper is all you need in a blender. If you can control the speed of the blades and push the ingredients into them - then you can blend anything! Some people insist on being able to turn on a setting and walk away from the blender, but I've always found it to be more trouble than it's worth. It's best to control the entire process. The 7500 and 5300 come standard with the same jar: the 64-ounce low profile jar. The ~3-inch lower height compared to the standard jar makes it easy to fit under counters. If you've ever had a standard Vitamix container, then you know that storing it in smaller kitchens can be somewhat of a challenge. It's great for large batches because of how easy it is to form a vortex. The wide blades and large surface area at the top pulls in all of the ingredients for the thickest smoothies you can imagine. Many times you won't even need the tamper. However, the major disadvantage is that the taller jar is better at small batches. Think about it, there's much less surface area at the bottom since it's more narrow. You can load in fewer ingredients and still get a vortex. Either way, if you're finding that you need a smaller vessel, you can purchase a smaller container on the Vitamix website which functions kind of like a personal blender size cup in the amount of ingredients it's optimal at blending. Just be sure to get the right jar for the right platform (C-Series or G-Series). Ah the tamper, my favorite part of any Vitamix blender. Both units come with the same tamper with the same exact functionality. If you haven't used one, it's basically a little stick that allows you to push the ingredients into the blades while the blades are going. This relieves you of the inconvenience and mess of having to stop the blender and mix stuff around with another utensil. 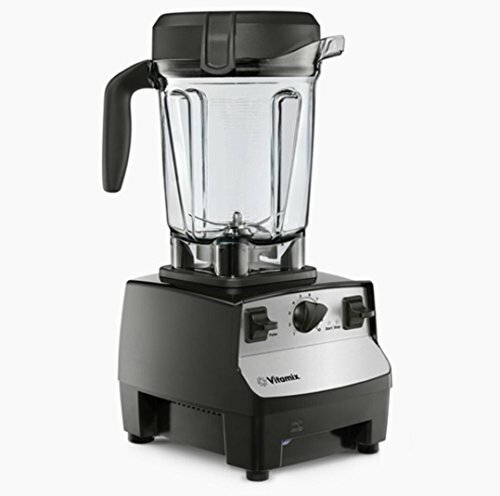 The main difference between the Vitamix 5300 and the 7500 is that they have different Vitamix Platforms. The 5300 is of the C-Series and the 7500 is of the G-Series. The platforms are important when you're considering additional jars. There's a lot of overlap in compatibility, though. Namely, you can still get smaller containers for the C-Series and G-Series. For those reasons, it's not a huge deal (which is why I don't usually mention it as a main difference). The container section on the Vitamix website is a great place to see what's compatible with what. The G-Series also has a next-gen motor and motor housing which is a bit quieter - around 40% (although I haven't measured myself). Keep in mind that blenders are still loud machines and the most you'll have it running is for around 5-7 minutes - and that's ONLY if you're making hot soup. Other than that, you'll probably have it running for no more than 30 seconds at a time. Both units come with the same 7-year warranty - which is awesome. The warranty is probably one of the main reasons why getting a Vitamix is so worth it. You know you're not buying another dinky piece of kitchen equipment that you're going to have to toss away in a few months - or even a few years. Vitamix really stands by their products and I've had nothing but good experience getting warranty claims handled. Most other folks have the same experience. At the end of the day, the 7500 and 750 are virtually identical. Sure, there are some subtle differences in the motor housing and color options, but other than that you're getting virtually the same unit. I would say, whichever one is cheaper when you're shopping around. There's no reason to pay more for the exact same functionality, unless you REALLY want the quieter unit - but a Vitamix blender is pretty loud either way. I'm confident that you will be happy with either selection! Check the current pricing of the 5300 here or the 7500 here. Or view our full guide to the best types of blenders.